When I am having an initial consultation with a bespoke dress client under my Featherstone Frocks label I always ask them to bring any favourite dresses so that we can try them on & see what suits their body shape best. It is usually very easy to see what suits a women’s body shape pretty quickly. For example a bias cut design (cut on the cross grain of the fabric) clings beautifully to the body & looks amazing on either very thin or much larger ladies. It is however very unflattering on ladies with tums or bums that don’t need to be highlighted. The same goes for skin colour, a pale complexion might suit a certain shade of blue, say a teal but a darker complexion will suit an ice blue better. The best way to ascertain the right shape & colour of clothing is simply trial & error & some good advice. All these observations will apply in exactly the same way to the choice of style & colour of your chemo headwear. Some people will prefer a headscarf style while others will prefer a stretch jersey hat style more. I usually advise people to think through at the start of their chemotherapy treatment the time of year you are in and which seasons it will need to carry you through. If it is winter take a look in your current wardrobe & see what colour jumpers are your current favourites and pick some headscarves to go with them. As knitwear is often plain maybe go for a pretty print that might pick out the colour of your jumpers. Equally think of your winter coat, this is an item of clothing you wear a lot at this time of year and you want to know you have a hat you can throw on with your coat as you leave the house. Same might go for a dog walking coat? 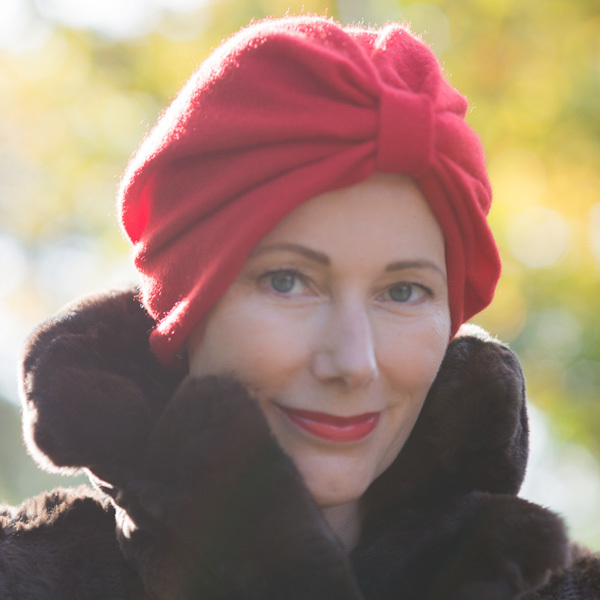 Now turn your thoughts to scarves – these become even more essential wear during chemo to keep you warm & many people feel their neck feels terribly exposed with the loss of hair. If you have a very favourite scarf which is patterned then think about a plain silk or cashmere headscarf or plain colour bamboo jersey hat. If it is Spring or Summer time you will want to think about keeping cool. It is for this very reason when I designed my “Alice” easy tie headscarf I specifically made it unlined. It is hard to be beat the Liberty cotton lawn which are not only the most beautifully feminine & pretty prints but it is like wearing a blouse on your head; cool, comfortable & washable cotton that will get softer & softer with each wash. For a selection of Liberty prints please visit my website www.chemoheadwear.co.uk. Another consideration is workwear. I recently had a lovely lady who worked in a hospital office and had to wear the NHS print blouse, this is a red/navy square print on a cream background. After much deliberation between a plain navy headscarf (a safe option) she eventually settled for a Liberty navy ditsy print in a gathered “Olive” hat style that pulled off the “print clash” perfectly. It really looked stunning. If you work in an office & need to wear a formal suit & blouse then pull out your work looks & find some headwear that complements them – maybe a smart silk “Alice” headscarf in a pretty print to lift the block colour of a suit jacket. It is hard to try & think these things through when you have hair & can’t imagine yourself without it. It is also hard to think about it when you have started having chemotherapy treatment & might be feeling like you “have been run over by a bus” to quote one of my clients. But with a little thought in advance you might be able to cushion the blow a little.